Fitting is one of my least favorite things about the sewing process and sewing is always easier when you have a pattern that you know fits. In updating my underpinnings, a new corset was on the top of the list. My corset is really starting to show its 5 years of ware with bones popping out and seams fraying. I was extremely lucky that the first corset I bought (an off-the-rack one) from Abraham’s Lady fit so well. Actually, I was more lucky that the site that I volunteer at bought a group of these corsets and I was able to try them on in person to see what size I was before buying online. So, with a corset that I have that fits, I set out to copy this corset and make a new version of it that would have non-fraying seams and bones in their proper place. 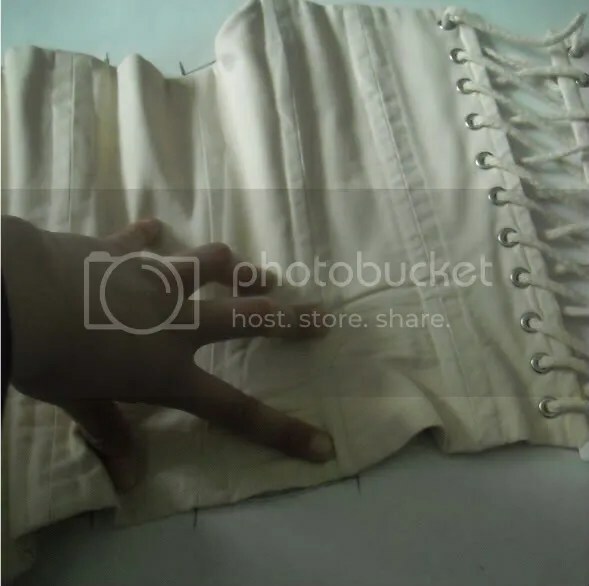 Taking a pattern off of a corset is really quite easy, and I thought I would write a little “mini tutorial” on the process in case anybody out there has a ready-made corset that fits them but needs updating. 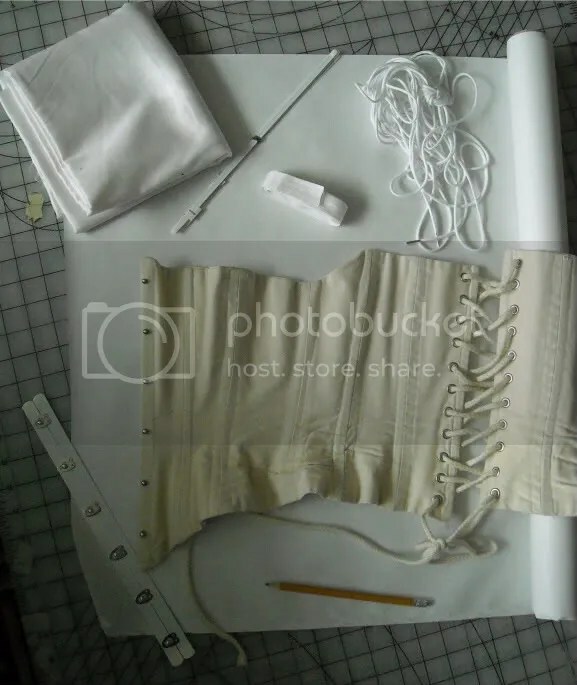 To start with, you’ll need 4 things: pattern paper, something to write with, a ruler and/or hem gauge and your corset. Next, move to the bottom of the corset. Keeping the part you just drew in line with the corset mark the seamlines and trace the bottom. Sometimes the bottom half tends to want to bunch up, so you might have to spread it flat. Finally, we have to connect the top marks to the bottom marks. 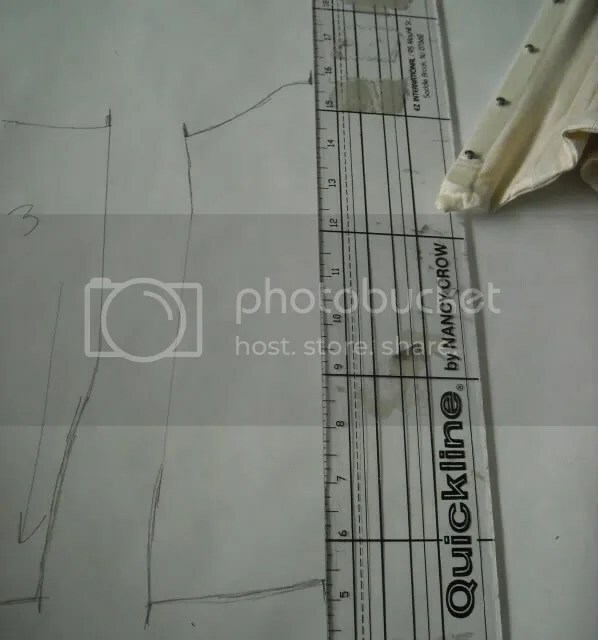 It’s helpful to draw any curvy corset pieces by hand, and connect the straight lines with a ruler. Continue this same process for all of your pieces. It also helps to number your pieces left to right (or right to left, whichever you prefer). Since we’ve just drawn the corset pieces as they appear on the corset, we of course have to add seam allowance. I just added a simple 1/4″ seam allowance on my corset pieces to save both fabric and time. 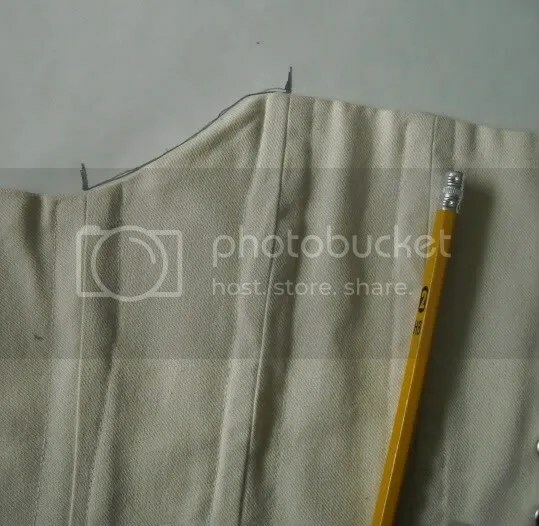 I used a ruler that had a handy 1/4″ marked on it for the straight pieces, and used my hem gauge to draw and connect the seam allowance on the curvy pieces. 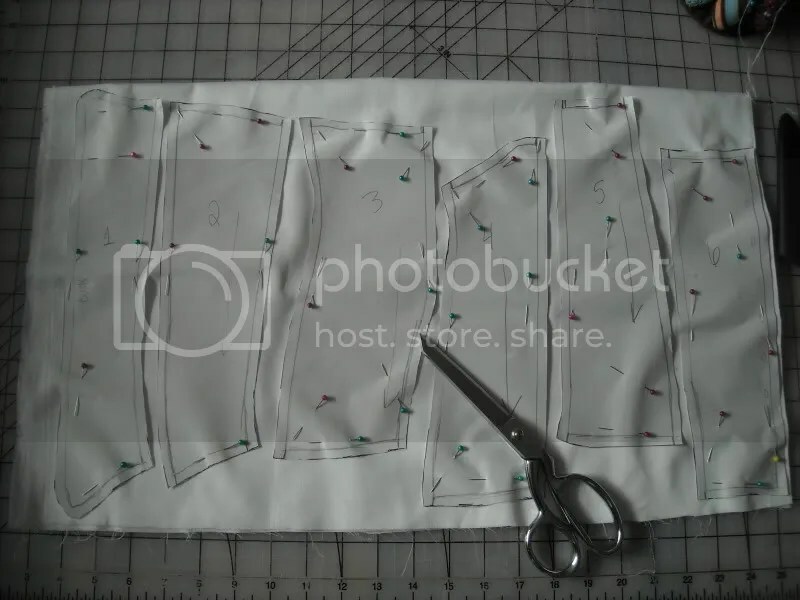 Finally, cut out all of your pieces, pin them to your corset fabric (I’m using cotton sateen here) and cut! 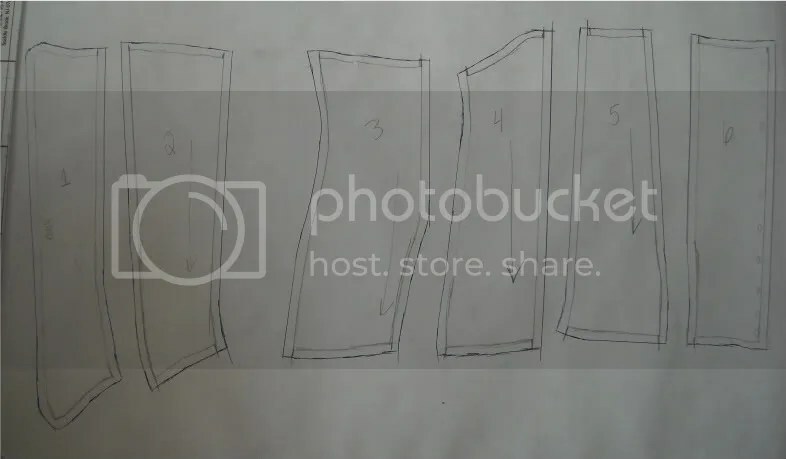 If you’re making a 2-layered corset like I am, it definitely saves time to cut your pieces out on 4 thicknesses of fabric (since you’ll need 4 of each piece – 2 for each front piece, and 2 for each back piece). To do this, just fold your fabric in half and then in half again. When cutting, use lots of pins and a very good pair of scissors. Now, to pin all of these pieces together and stitch . . . Thanks, Sophia! And that would be scary to lose all of your corsets! I’m glad that I have a pattern to work off on, but it can be time consuming to sew all 4 layers. And putting the hardware in (busk, boning channels, grommets) can also be tedious. I just found you! So glad to have. Love seeing your stuff! Thanks, so much Emily and so glad you found me! I took a peek at your blog and your reproductions are fabulous. Hey, just found you. Love the copycat tutorial, that is just what I was needing! Thanks. Did you do another one on how to stitch it all together and finish the corset? I didn’t see it anywhere.